I had some instant bulgogi sauce left over from cooking a bulgogi dish last month. I know, it’s been a while! 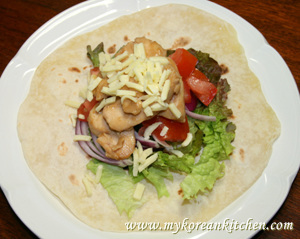 So, I thought it is really time to use it up, and this Chicken Bulgogi Burrito is what I came up with. Anyway, if you can get tortillas easily from shops, this chicken burrito will be a very easy cooking. You can get the tortillas on the internet for 3,450 won (US $ 3.60) for 500 g (12 sheets) if you can speak Korean that is. 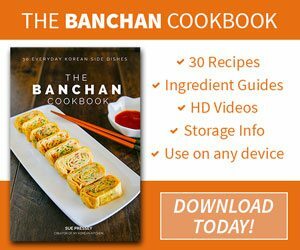 However, if you live in a small city (in Korea) and can’t order it on the internet, then we need to start from the scratch. If this is you, check my how to make tortillas with limited resources recipe. Enjoy! 1. 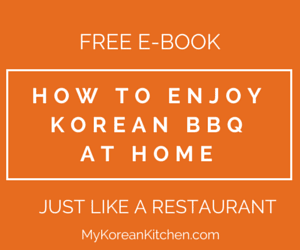 Marinate the chicken with instant Bulgogi sauce for about 15 minutes. 2. Stir fry the chicken in a wok until it cooks. 3. Place the tortillas on a plate. Add the topping as you want. But don’t be too greedy, otherwise, as you know it is hard to wrap it. 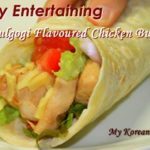 (I add lettuce on the bottom, then onion, tomatoes, chicken, cheese) – You can add some sauce like honey mustard or chili sauce. Though it still tastes nice without these sauce. Wrap it. 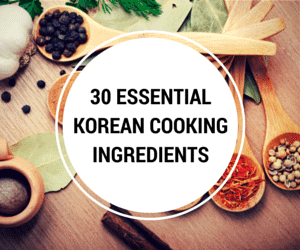 Marinate the chicken with instant Bulgogi sauce for about 15 minutes. Stir fry the chicken in a wok until it cooks. Place the tortillas on a plate. Add the topping as you want. But don’t be too greedy, otherwise, as you know it is hard to wrap it. 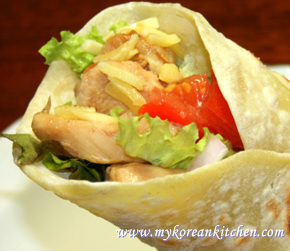 (I add lettuce on the bottom, then onion, tomatoes, chicken, cheese) – You can add some sauce like honey mustard or chili sauce. Though it still tastes nice without these sauce. Wrap it. It is good to hear that my instruction is easy to follow. Hi..just to let you know that I just love your recipes! I’m a HUGE fan of korean food and really appreciate the clear instructions you give which I can replicate at home. Keep up the good work! It is really easy to make and was yummy. I am going to make it more often I think. These burritos sound great and easy!